It is always a great pleasure to present our special edition celebrating and reporting on The Treasurer’s Deals of the Year Awards. This year, the awards generated some tough calls for our judging panel, with all the categories attracting a wealth of high-quality entries. Innovation and professionalism were much in evidence across all areas – a fact that made the judging process difficult, but gratifyingly so. 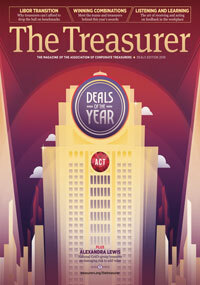 As ever, in the deal categories we focus on the fundraising achievements of treasurers. In the team categories we look at their broader contributions to the organisations they work for. The panel agreed that treasurers continue to respond to today’s unpredictable environment with flair – creating opportunities for their organisations while maintaining best-practice operations – evidence for that was abundant. The still-new but maturing Sustainable Finance category proved particularly competitive, a sign that this area of finance is attracting just as much ingenuity as more established fundraising. Entries reflected a wide variety of approaches to green and sustainable finance. For the first time ever, the judges decided on joint winners. Turn to page 27 to ind out more. This year’s Corporate Finance award was likewise closely fought, with the judges commenting that the shortlisted deals were the best they had seen to date. Our winner in that category also takes the accolade of winner overall – proper recognition of a major undertaking achieved in a short time frame. You’ll find details of this on page 26. For our profile in this edition, we looked to serial award-winner National Grid and spoke to group treasurer Alexandra Lewis about what it means to run a top-light team. Lewis, who manages teams in London and the US, recounts how one of her most significant career moves – out of treasury and onto National Grid’s senior HR leadership team – helped her see the business through a different lens. The perspective she gained from working at a high level on reward and the time she spent feeding into discussions on leadership, incentives and how you balance risk and reward in a business has become embedded in how she now looks at treasury. Collaboration is the key, she says. Turn to page 14 for more. in May, with some thoughts from news anchor Jon Snow, who will deliver a keynote at the event (see page 11). We are also very proud to be celebrating 40 years of the ACT. Our conference edition will feature the personal journeys and stories from professional treasurers. If you or your team have a story about your experiences in treasury that you’d like to see in our conference edition, please email me at liz.loxton@thinkpublishing.co.uk, with ‘40 years’ in the subject line.